The League Of Extraordinary Gentlemen Lobby Card x 8 Set Sean Connery| Based on the comic book miniseries by Alan Moore, The League of Extraordinary Gentlemen takes place in an alternate universe where the characters of several literary classics exist in reality. As if that weren't enough, they've been assembled together in 1900 by Queen Victoria as a team of evil-fighting heroes. 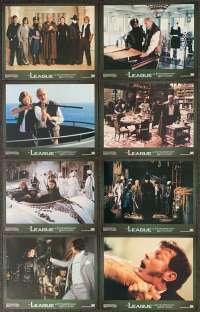 Among them are Allan Quatermain (Sean Connery) from H. Rider Haggard's King Solomon's Mines; Mina Harker (Peta Wilson) from Bram Stoker's Dracula; Tom Sawyer (Shane West) from several works by Mark Twain; Dorian Gray (Stuart Townsend) from Oscar Wilde's The Picture of Dorian Gray; Captain Nemo (Naseeruddin Shah) from Jules Verne's 20,000 Leagues Under the Sea; The Invisible Man (Tony Curran) from H.G. Wells book of the same name; and several others. Working together, the odd assortment of characters must combine their powers to defeat a mysterious villain and save the world from certain destruction. Directed by Stephen Norrington (Blade), The League of Extraordinary Gentlemen also stars Jason Flemyng, Tom Goodman-Hill, and David Hemmings.